The Holy Bible In Its Original Order is an extraordinary Bible—unique in two ways. 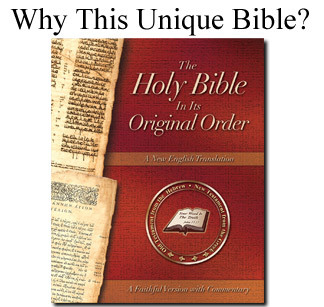 First, it is the only complete Bible ever published in a single volume that accurately follows the original God-inspired manuscript order of all the books of the Old and New Testaments—making it the “Original Bible Restored.” In addition, once the original order of the 49 biblical books has been restored, the Seven Divisions of the Bible are also re-established: The Old Testament contains: 1) The Law, 2) The Prophets, and 3) The Writings. The New Testament contains: 4) The Gospels and Acts, 5) The General Epistles, 6) The Epistles of Paul, and 7) The Book of Revelation. With this restoration, God’s purposeful design of the Scriptures begins to unfold, revealing His divine inspiration. As the apostle Paul wrote, “All Scripture is God-breathed”—and thus reflects the mind of Almighty God, Creator of heaven and earth. It is the truth of God from the God of Truth, Who cannot lie; it is His personal revelation to mankind—the pinnacle of His creation—whom He made in His own image. From Genesis to Revelation, God reveals His awesome, eternal plan and purpose to those who love and obey Him. Included are vital commentaries providing accurate accounts of the history and preservation of the books of the Bible: Who wrote them? When were they written? When were they canonized and by whom? Other Commentaries and Appendices answer critical questions such as: When was Jesus born? How did Jesus Christ fulfill the Law and the Prophets? When was Jesus crucified? How long was He in the tomb? When was He resurrected? What does it mean to be born again? What are works of law? What are the true teachings of the early apostolic New Testament Church that Jesus founded? Also, biblical and historical chronologies show an accurate timeline from the creation of Adam and Eve to the present. There are detailed footnotes and marginal references explaining hard-to-understand passages of Scripture. In this Second Edition, over 1200 Old Testament passages have been clarified. Plus, a new appendix—Understanding Paul’s Difficult Scriptures Concerning the Law and Commandments of God—has been added to counter the popular misconception that the apostle Paul taught that God’s laws have been rendered obsolete by Jesus’ sacrifice. Topics such as the “curse of the law,” “works versus grace,” “justification by faith,” and more are carefully examined—proving unequivocally that, coupled with salvation by grace, the laws and commandments of God are fully in force today.